So after hiking a pretty exhaustive 28 kilometer day, I remember how surprised I was to feel really good the next day when we walked from Arzúa to Pedruzo. 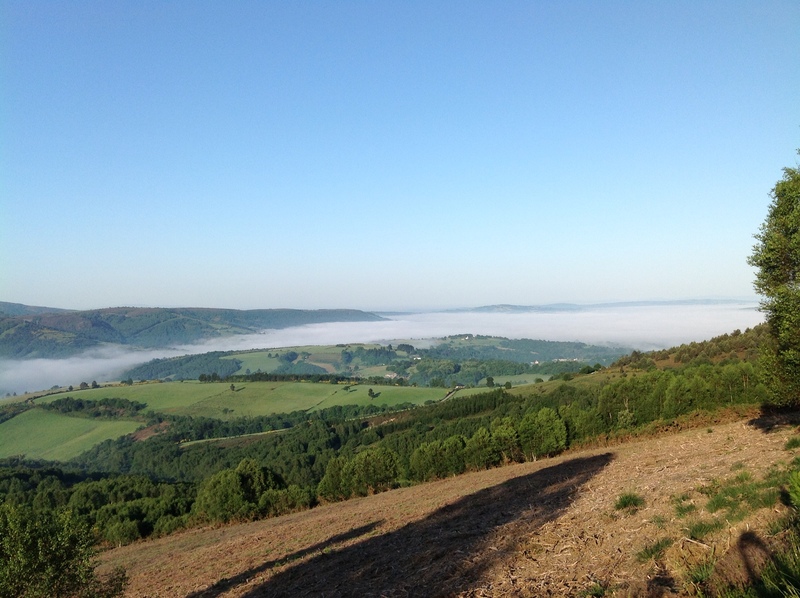 We started the 20 kilometer day by leaving at 7 as usual, picking up the trail and setting off into the outskirts of Arzúa between interlacing fields and forests. I felt like we were racing the sun as it peeked out above the valley and the morning fog slowly disipated. The trail slowly twisted past farmhouses and sleeping cattle dogs and I whipped out my camera to capture the unbelievably picturesque surroundings. Within the first hour or so of walking I knew I was going to have a good day. My knee pain was subdued for the time being, I had worked out all my morning sores, and I felt a surge of energy. I remember absolutely loving this hike and feeling inspired. As much as I love meeting so many new people on the Camino, I really benefitted from walking alone for some of the hike and getting time alone since we’re surrounded by other students and pilgrims for the entirety of the Camino. I then remember seeing more kids from our group that served as really good motivation to keep up my pace and work my way up to them. We hiked the remaining 10km or so until we reached Pedruzo in really good time and I was very pleased with myself especially right after a really hard day. 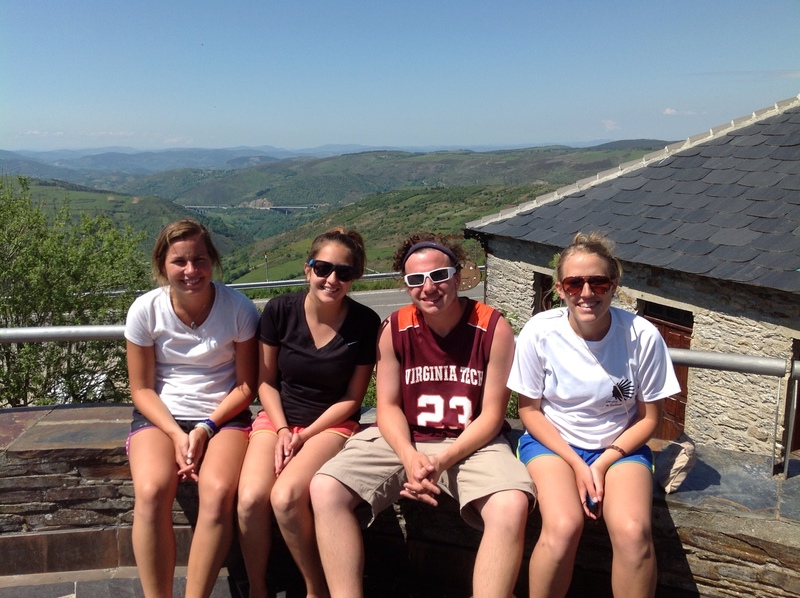 And after this day I remember realizing that we were almost done with the Camino. Coming off of having such a good day, I knew I would be able to finish the last 20 km walk into Santiago strong. Photo: Tom, Julie and Heather enjoy some trail time together. 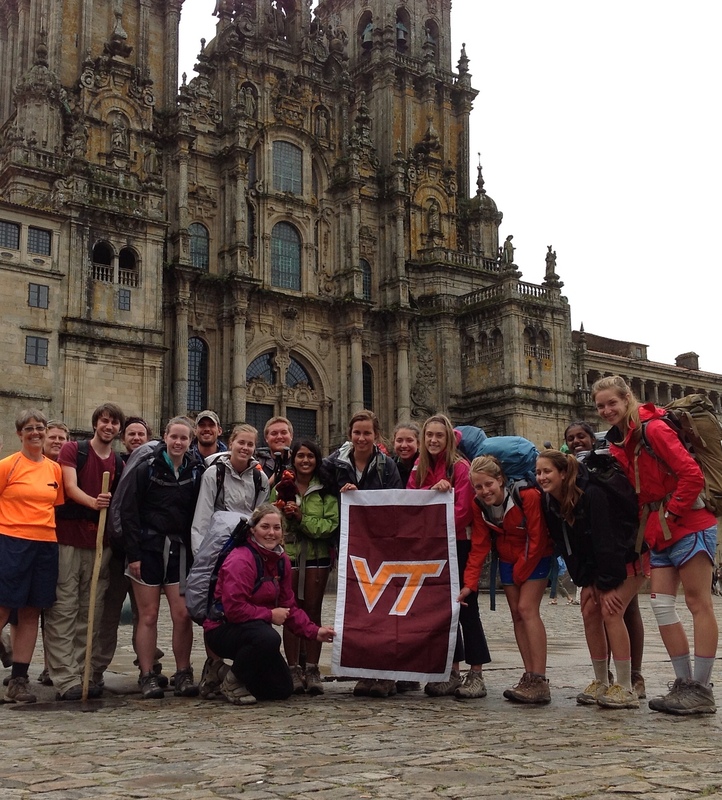 The Camino Hokies pose in front of the Cathedral in Santigo. The students begin their immersion experience with local families now. As a Freshman at Virginia Tech, I often remember the constant question of “What is a Hokie?”. At orientation, the leaders told the incoming Freshmen that we are all Hokies. 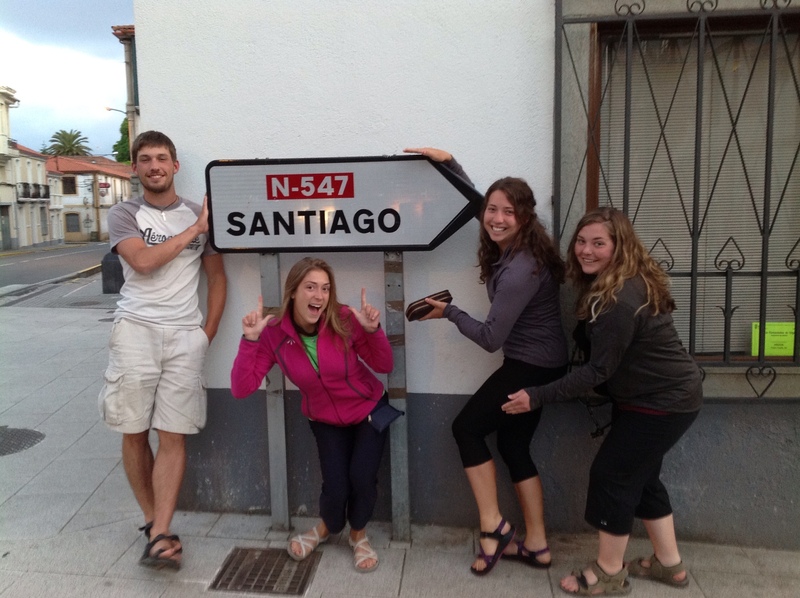 My definition of a Hokie has greatly expanded and complexed through my hike on the camino. At around seven in the morning every morning, fourteen students set out from an albergue and head to the next town. As the day processes on, we scatter along the camino at different paces. I often tend to be in the front part of the pack by the time I need to stop for a “second breakfast”. During the time I sit there and enjoy a tortilla on a sandwich, another hokie pilgrim will often catch up to me. There is a unique feeling that happens every time I recognize a familiar face on the trail. The often smiling faces gives me a wave and approaches me saying, “how are your feet?”. As time continues to pass, we start to form a group of “Techies”, as we are often known on the trail, or, at the cafe we are resting at. This force of comfort and support helps me put the boots back on and continue for another five, ten, or twenty kilometers with my Hokie family. As I traveled to Rabanal, the voice of a biker yelled “let’s go” to a group of us on the trail. The unexpected familiar chant caught us all off guard as we turned and smiled and yelled back “Hokies” to a fellow pilgrim. 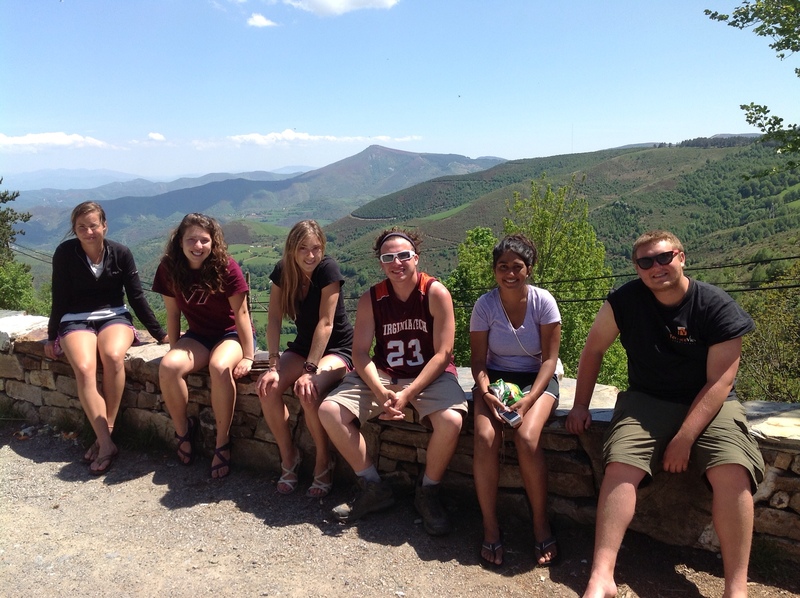 After two weeks of hiking in a foreign country, a Hokie has become more than a fellow classmate in Blacksburg, Virginia, who enjoys watching a football game in Lane Stadium. A Hokie to me means a smiling face who offers kind words of motivation as we aspire together in our common goal of reaching Santiago. 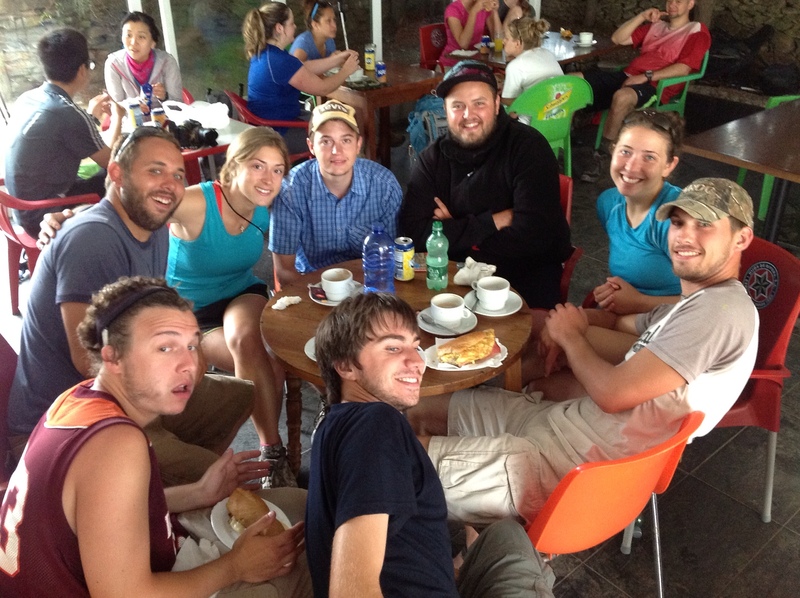 Photos – above, Olivia with Ellie, Stefanie, Tom, Shoma, and Patrick after a long day climbing up to O’Cebreiro. Below – Caleb with Stefanie, Ellie, and Rachel. When visiting a foreign country, its important to immerse yourself in the entire culture to gain a really thorough and incredible experience. As an aspiring Spanish teacher, this is especially crucial, because I want to be as knowledgeable about the culture as I can for the sake of my future students. With this in mind, when I sat to down to dinner in Triacostela and I saw cow tongue on the menu (a spanish delicacy), I knew that I had to try it. I am so glad that I did. When I took the first bite, I almost fainted it was so good. Lengua de Vaca tastes just like pot roast, which is one of my favorite meals from back home, so experiencing that flavor in a piece of tongue was a truly pleasant surprise. Although trying a piece of random food may seem like a benign thing to talk about when there are so many bigger things to see and explore, the smaller experiences are really the ones that allow you to fully delve into the surrounding culture. When I become I a teacher, I am going to drill that idea into my students’ heads. The Camino is all about trying new experiences and meeting new people and eating things you normally wouldn’t eat, and if you don’t try new things, you can’t really grow as a person, because you are not taking the opportunity to grow. 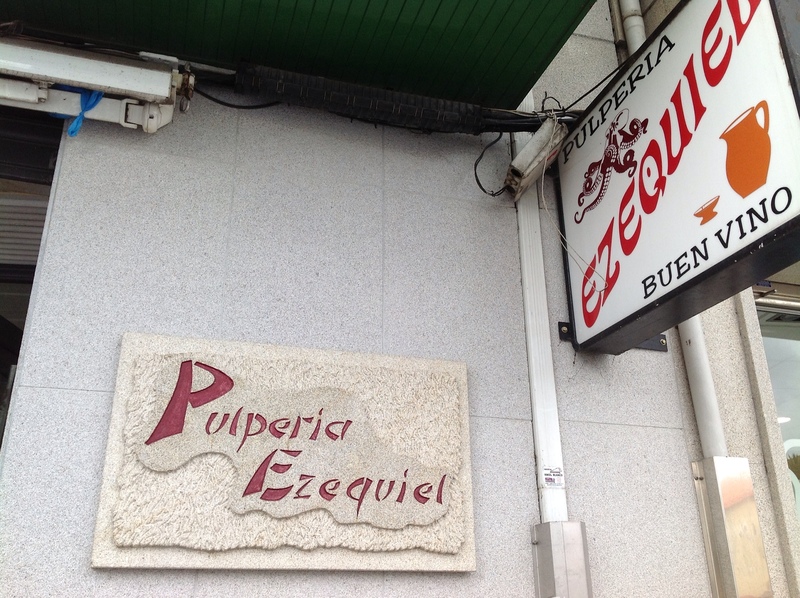 Had I not walked on this Camino, I would not have had the chance to try cow tongue, and I would never know the delicious taste that it provides. Although to some people it may just only be cow tongue, to me its a reminder that you have to try everything in life, even if it seems a little strange. 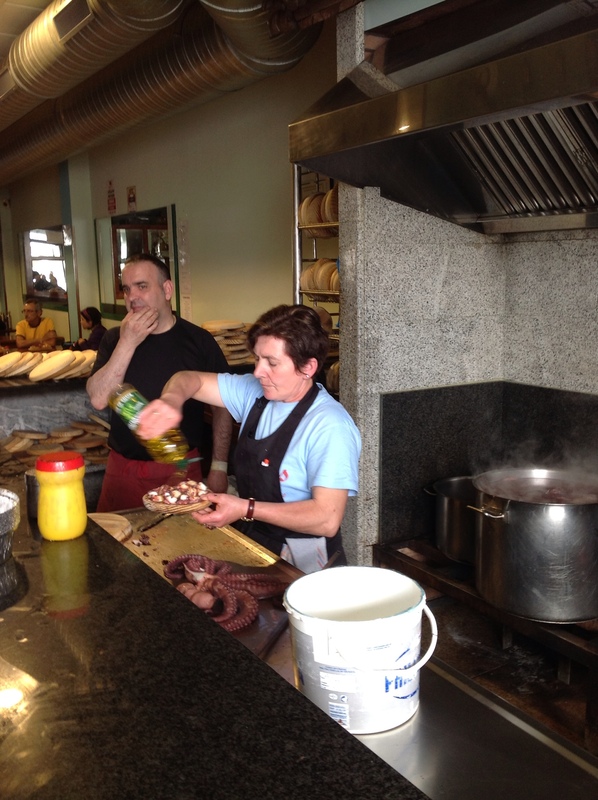 Editor’s note – All the hikers enjoyed some octopus for lunch yesterday in the city of Melide, which has a reputation for its pulpo. Along the Camino I’ve met other pilgrims from all over the world. I expected this, but what I didn’t expect was the sense of camaraderie among them. It’s very easy to forget your toothpaste somewhere, or to get a blister when you have no bandaids. However it’s never hard to find someone who can help, and most of the time without you even asking. Several times I have been rubbing my feet during a break because of normal aches and pains and have had pilgrims walking by offer me bandaids or tape to wrap my feet, or even just advice and words of encouragement. I wear a knee brace occasionally, and every time I do passing pilgrims ask how I’m feeling and how my knee is holding up on the many downhill portions. Never before have I been in an environment with such a diverse group of people that share the same goal and care so much about each other’s success. It reminds me of the environment at Virginia Tech, but on a wider global scale. 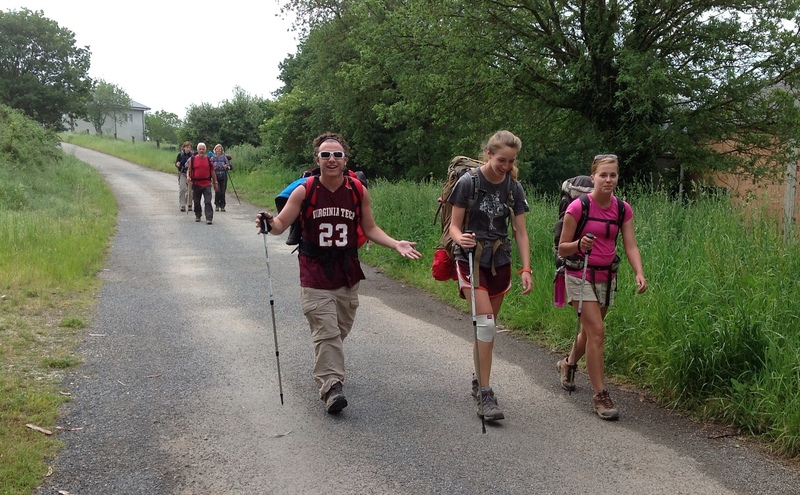 The kindness of other pilgrims has inspired me and the rest of the group to contribute to the spirit of the camino in our own ways. One student was able to help an elderly pilgrim carry his backpack up a difficult portion. Several of us lent supplies to a Canadian pilgrim whose backpack had been lost by her airline, so for a few days she only had the clothes on her back. She then graciously shared a bottle of wine with us while we all talked about our reasons for making the hike to Santiago. Traveling in such a large group, we are not the typical pilgrims, but we have all felt accepted into the pilgrim community nonetheless. We have only two more days left on the trail, but I hope once we have arrived we can all take the pilgrim spirit back home with us. Photo – Kelsey, on the far right, with Olivia, Ashley, and Tom. Now that we are approaching our very last day walking the Camino de Santiago, I feel that the time has come to truly reflect on the experiences that have come before me on this life changing journey. One aspect of the Camino that really defines what I will take home with me is the other pilgrims that I have met along the way. From the U.K to Switzerland to South Korea to Germany, I have met and walked with people from all walks of life, and around the world. On a typical day, I walk with a few people from our original group, with two hilarious guys from Germany, and a very outspoken Boston native, and each and every day I have an amazing time, despite the distance we walk. The countryside is always absolutely gorgeous, and the conversation, to put it lightly, is entertaining. However, I can safely say that I have learned so much just from talking with them along the trail about just about everything. 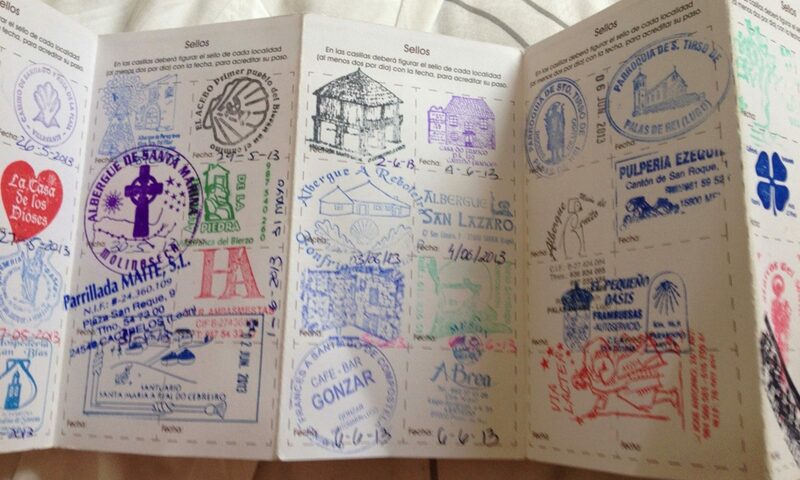 Every person on the Camino has a story, and listening to them has completely changed my life for the better. To top it all off, I have made some amazing new friends that I will continue to cherish for quite some time. Eric, front and center, with Camino Hokies and newfound buddies from Boston and Germany. I first got the idea to put patches on my backpack from the movie, The Way. A good friend of mine got my first patch, a small, cream colored shell to symbolize my pilgrimage. The next patch that I found was from Avila because it was my favorite city that we visited. I loved walking on the walls and learning the history of the city. I have a lion patch from Leon where we started, an Astorga patch, and a Galicia patch. 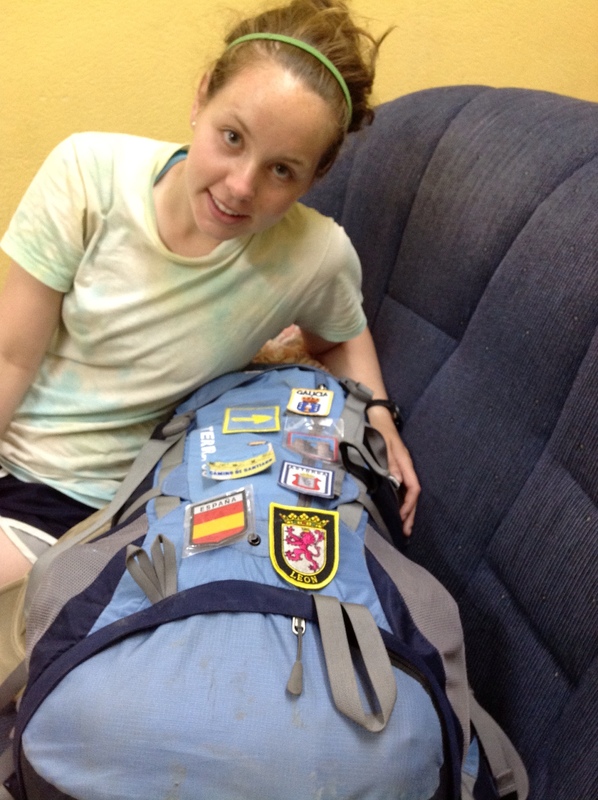 My favorite patch so far is a map of the Camino de Santiago and some day I hope to walk the whole trail. I have eight patches total and they are all very significant to me. Each one reminds me of a different place but they all revolve around my individual pathway. They can be a struggle to find but I hope to have many more by the end of this trip.